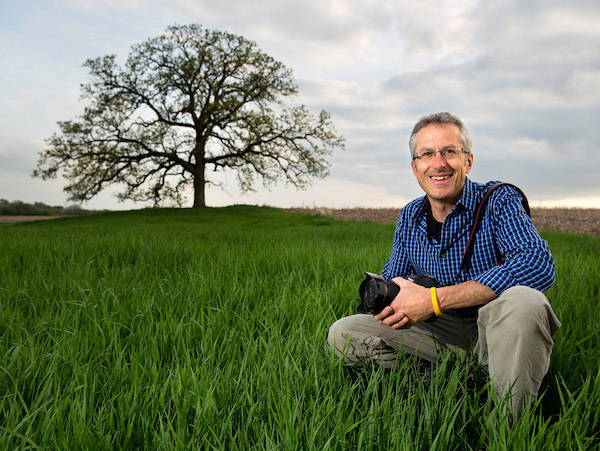 MONROE, WI – Opening at Monroe Arts Center's (MAC) Wellington Gallery on Friday, September 8 is the exhibit "That Tree" by Platteville, Wisconsin editorial and corporate photographer, artist, and public speaker, Mark Hirsch. This photography exhibit documents a year in the life of a lonely Bur Oak tree created exclusively using the camera in his iPhone. "That Tree" will be on display at MAC, 1315 11th Street, Monroe, Wisconsin through Friday, October 27. In January of 2012 while recovering from a near fatal car accident, Hirsch purchased his first iPhone. He was encouraged by a friend to treat his new iPhone like his professional cameras. The first picture he took with his new iPhone was a photo of that Bur Oak tree. Mark explains, "During a terrible snowstorm I was making the six mile drive to my home in the country. I turned onto the road I live on and saw the tree shrouded in the blowing snow and decided to make a photo of it using my iPhone. I sat down to open the files on my computer and I was actually blown away by the image quality. On March 13, I was making the same trip home, admiring an incredible sunset, wishing I had something I could place between me and that gorgeous sky for a photograph. I turned onto the road I live on and saw the tree sitting in the perfect spot. I walked down and made my image for the day with "That Tree" and that gorgeous sunset." Ten days later, a good friend of Mark finally saw the photo he had posted and commented, "Dude, what's with you and that tree? You should do a photo-a-day with it." His remark was also the source for the project's name. The next day, on March 24, 2012, Mark officially started his unintended adventure of the 160 year-old Bur Oak tree in a Wisconsin cornfield. Upon observing the photos in this exhibit, it is evident to see that Hirsch carefully thought out all aspects of each photograph. "I am working very hard, driving myself to make something that I consider to be meaningful," he said. During each photo session, he spent an hour or more shooting. "The quality of the light and the weather often decided what kind of picture the day would produce," he said. On Day 365 for the final photo, he invited anyone who could to join him. Three hundred people showed up (and 12 dogs). Those who couldn't come sent objects to decorate the tree. The year-long project was completed on March 23, 2013. Hirsch remarked, "That tree gave me healing and inspiration that I needed more than I had realized. And it taught me to slow down, take time to look around, and appreciate the almost (but not quite) hidden beauty that abounds in our world -- sometimes even in your own backyard." Hirsch regularly exhibits his photos of "That Tree" in galleries, and his story has been featured by many worldwide media organizations including CBS Sunday Morning, NBC News, The Sierra Club, Huffington Post, The Guardian, Le Monde, Chicago Tribune, Denver Post, San Francisco Chronicle, The Daily Mail (UK), and many others. He spent twenty years in the newspaper industry as a photojournalist, photo editor, and visuals editor at the Telegraph Herald in Dubuque, Iowa until ultimately embarking on a freelance career in 2006. His clients include Getty Images, The New York Times, and John Deere Corporation. "That Tree, an iPhone Photo Journal Documenting a Year in the Life of a Lonely Bur Oak," a fitting title of a full-color hardcover book published by Press Syndication Group (PSG), will be available for purchase for the duration of this exhibit through Monroe Arts Center. A gallery opening reception is scheduled for Friday, September 8 from 5:00 pm to 7:00 pm in MAC's Wellington Gallery. A brief gallery talk begins at 5:30 pm. This event is free and open to the public. This exhibit has been made possible by MAC Corporate Underwriter Colony Brands, Inc., and Season Media Underwriter Big Radio, and with additional support provided by Michael and Shelley Muranyi, Anonymous, Paul & Sue Barrett, Kevin & Chris Callahan, Pete Guenther & Barb Woodriff, Lee & Chris Knuteson, Don Amphlett & Jan Johnson, Kevin Indergand & Christine Pieper, and Chuck & Chris Wellington. The gallery exhibit "That Tree" showcases a portion of a photographic journey by Mark Hirsch. This exhibit will be on display in Monroe Art Center's Wellington Gallery from September 8 through October 27. An opening reception is scheduled for Friday, September 8 from 5:00 pm to 7:00 pm. A brief gallery talk will begin at 5:30 pm. This event is free and open to the public. Mark Hirsch shooting on location of "That Tree"